Be the first to share your favorite memory, photo or story of Curtis "Curt". This memorial page is dedicated for family, friends and future generations to celebrate the life of their loved one. 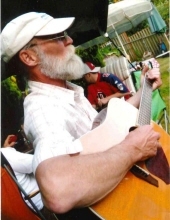 Curtis "Curt" M. Weinstein, 66, a resident of the Gaston community, died Thursday, April 4, 2019 at the Tuality Community Hospital in Hillsboro. Curt was born and raised in Portland, Oregon. He died peacefully at Tuality Community Hospital on April 4, 2019. He is survived by many special friends and persons who chose him as family and enriched his life. Curt was the type of guy who had a 10 minute story for a 2 minute song. To send flowers or a remembrance gift to the family of Curtis "Curt" Michael Weinstein, please visit our Tribute Store. "Email Address" would like to share the life celebration of Curtis "Curt" Michael Weinstein. Click on the "link" to go to share a favorite memory or leave a condolence message for the family.